FILE - Ofo France general manager Laurent Kennel poses with city bike-sharing service Ofo bicycles in Paris, Oct. 19, 2017. Grabbing a bicycle from a docking station and riding the streets of Paris used to be one of the city's many charms, but the once-loved Velib system has fallen into disarray and some new dockless bike-share programs are struggling to survive. FILE - Velib bikes are pictured in Paris, Oct. 25, 2017. After it launched in 2007, Velib quickly became a hit, signing up more than 250,000 users who could take advantage of 20,000 bikes around the city. But advertising company JCDecaux's concession to run Velib expired last year. A French-Spanish consortium called Smovengo won the tender to run the service for the next 15 years, but it struggled to meet a January deadline to install new docking stations and has battled a raft of technology problems, leaving users frustrated. At the same time, four dockless bike-share programs, all run by Asian operators, have popped across the city, offering users the ability to unlock a free-standing bike via an app for a fee. 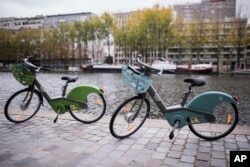 While initially popular thanks to their novelty and Velib's problems, some of those schemes are now running into trouble, with users unhappy with the quality of the bikes, many of which have been vandalized or thrown in the Seine. Singapore's oBike this week became the second of the programs to give up on Paris, which wants to be an urban leader in green mobility. Officials of oBike did not return calls, but a former official said key staff in France had left the company. FILE - Several Gobee bike-sharing service vehicles are seen on a sidewalk in Paris, Oct. 10, 2017. 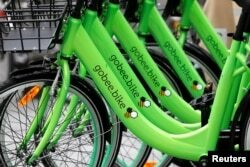 In February, Hong Kong startup Gobee.bike halted its operations because of theft and vandalism. China-owned bike-share firms Ofo and Mobike remain active and have been steadily growing their numbers, thanks in part to Smovengo's struggle to get fully up and running. Laurent Kennel, general manager at Ofo France, said the firm now had about 2,500 of its bright yellow bikes on Paris roads and aimed to increase that to 3,000 to 4,000 by the end of summer. "In Paris and elsewhere, there have been low-quality bikes that were not made to last," he said. "Free-floating bike sharing hasn't created the chaos that some had predicted a few months ago. It's going quite well." FILE - A commuter uses an app to unlock a bicycle from bike-sharing company Mobike in Beijing, China, March 29, 2017. Mobike also has several thousand of its red bikes on Paris streets and has been adding a larger version, more suited to European frames, also with three speeds, like Ofo and Velib. Paris cyclists have welcomed the new programs, but are nostalgic for the old Velibs, which they say offered a better, smoother ride and were cheaper, thanks to state subsidies. "Bike-share services are good for short distances. You can drop them wherever you want, which is convenient," said Paris cyclist David Bober. "But their quality is not great and they are not very comfortable for long distances." He said he used to pay about 30 euros a year for his Velib subscription but that membership for two Asian dockless schemes costs him around 20 euros a month. Paris Mayor Anne Hidalgo has recognized that the city needs to get a grip on the programs and make sure Velib works. "We know there is this entire field, this entire space of mobility which exists and can be managed in a different way. But for us it clear that it must be regulated," she said. Still, more startups are using Paris as a test center. Last month, California-based Lime launched a fleet of dock-free electric scooters in the city, part of a wider rollout in several European cities. Danish bike share operator Donkey Republic has also launched several hundred dockless bikes. Unlike Mobike and Ofo, the large Danish bikes cannot be parked anywhere but must be chained up at designated parking spots.